Susie O’Brien and Imre Szeman. 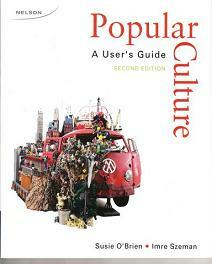 Popular Culture: A User’s Guide. 2nd Edition. Thomson Nelson, 2009. 398 pp. Use this book! The second edition of Susie O'Brien and Imre Szeman's Popular Culture: A User's Guide traverses a vast range of popular culture—its slippery definitions, its history as a field of study, the stakes in its production and consumption, its relevance to the construction of the body, community, space, globalization—with specificity, nuance and lucidity. As a textbook, one of its core aims is to increase students' critical agency in their relationships to popular culture. Especially as we're back on the treadmill of rising class sizes and diminishing resources, it also represents very welcome support for instructors. For students, what often proves most illuminating (or, for some, simply irritating) about taking a course in cultural studies is its revelation of the connection between popular culture and power. For teachers, one of the insights that proves most strangely elusive—one that they often need to be reminded of by students—is that popular culture is about pleasure. Figuring out what happens at the intersection of those forces of power and pleasure is perhaps the principal value of studying popular culture (24). The power-pleasure axis recurs throughout the book, nuancing its analysis of popular representation, production and consumption. Shopping, for example, is discussed as a site both of individual desire, pleasure and agency and of structural restrictions and corporate manipulation, ultimately a practice that is "neither wholly empowering nor wholly disempowering" (175). The book clearly results from considerable pedagogical experience. Without explicitly saying so, and without a hint of condescension, O'Brien and Szeman anticipate and discourage some tendencies—such as generalization, presentism, purism, and theoretical obscurantism—which can dog discussions of popular culture in and beyond the classroom. Their commitment to historicizing takes several forms. The work is, literally, book-ended with history: multiple timelines—tracing theory, popular culture and sports, politics and society, and making modern life, from 1750 to 2008—printed in the front and back endpapers. They repeatedly demonstrate that categories (including "high" and "low" culture) and concepts (such as identity and race) make meaning in historically specific ways and that what may seem quintessentially contemporary—globalization and media convergence, for example—trails a long history. Their vast range of examples from film, television, music, cartoons and newspapers are embedded in mini-histories of mass media, Hollywood and market segmentation. And they pepper the text with case studies which connect local and global, current and historical practices. While the book includes many Canadian examples in its global range of cultural and theoretical references, the case studies are most forcefully oriented towards Canadian perspectives. One case study begins with the 2002 incident in which a Hamilton, Ontario man and his son were charged for violating a municipal bylaw by playing touch football and hockey on the street. In considering what this case suggests about the politics of recreation and public space, as well as the tension between communal and corporate forms of "the popular," the authors trace connections back to the 1830s' Enclosure Acts in the U.K., the industrial revolution, the emergence of working-class consciousness, the "rational recreation" movement, and long-standing struggles over work and leisure in capitalist societies. Later, in considering the role of popular culture in forming community and exclusion, they move from the popular television series set in California, The O.C., to the Canadian television series set in Saskatchewan, Little Mosque on the Prairie, to the real-life case of Hérouxville, Québec, whose town council prepared a code of conduct for immigrants, and back to The O.C. With these examples which are local and familiar in different ways, the authors deftly guide students through the contribution of representation to identity politics and imagined communities. The book ends with a thought-provoking case study of Canada's defence of cultural sovereignty as illustration of how globalization shapes "the notion of culture as a whole" (345). In their specificity, O'Brien and Szeman are topical but never glib or simplistic. They draw on wikis, blogs, and recent interviews with Catholic and Protestant children from Northern Ireland. They discuss the evolution of copyright and the resistant practice of copylefting; the rise of netizen-ship (that is, digital forms of belonging), locavores (adherents to the local food movement), and runaway films (productions intended for distribution in one country but filmed in another country). They eschew "the rosy haze of nostalgia" (38) in comparing preindustrial folk culture to contemporary commercial forms and "a tidy linear narrative" (249) in moving from national to post-national or diasporic identities. In exploring oppositional cultural practices—from culture jamming to punk music to body-modification—they note that any challenge to social norms "cannot avoid negotiating them" (212). Generally, their position is anti-purist: "we shouldn't demand purity of aims or authenticity of intent from subcultures and countercultures—in the contemporary world, it is best to imagine that everything is already contaminated, and go from there" (267). Into all of this they introduce an impressive range of theoretical frameworks, not as an inert menu of approaches, but in the form of particular theorists whose thinking is integrated into discussions of popular culture practices. Laura Mulvey on visual pleasure, Stuart Hall on encoding/decoding, and Michel Foucault's theories of discourse all figure in the chapter on representation and the construction of social reality (Foucault's work on power/knowledge and the history of sexuality appears in the chapter on identity). The thinking of Henri Lefebvre and Guy Debord is part of the discussion of the spaces and places of popular culture. The authors' handling of these approaches is both lucid and judicious, as they weigh the usefulness and limitations of various schools of thought. The chapter on the production of popular culture, for example, rehearses the Frankfurt School analysis of the culture industry, illuminating its powerful critique of popular culture in producing and managing the social order while refusing its totalizing conclusions and its potential to close off critical analysis; the authors conclude that "popular culture is a messy and unwieldy object that can't be explained by reference to a single explanatory model" (126). In the chapter on the consuming life, they introduce Thorstein Veblen and Pierre Bourdieu, commenting that we need not take either "as being totally correct about consumption in order to find a great deal that is useful in their descriptions of the symbolic meaning of consumption" (168). This judicious engagement is salutary, especially in a text which could well provide junior students' first encounter with theorists. A series of "suggested activities" (which could issue in oral or written exercises) brings this vast network of theories, examples, and debates home to students, asking them to reflect on their own practices, attitudes and knowledges. Especially in the first two-thirds of the book, these activities are inventively construed to echo and extend the material under discussion. In the wake of the story of the walkman, students are asked to identify contemporary cultural products which invent, rather than respond to, a social need. After a discussion of the theories of Karl Marx and Louis Althusser, students are asked to consider how educational institutions work to interpellate them into particular social roles. The activity which targets students' own shopping patterns is situated within larger theories of consumption and histories of consumer culture, a position which encourages connections among the personal, the ideological and the historical. Other activities target students' attitudes to file-sharing, their relationship to coffee culture, their thoughts on the contemporary segregation of cultural activities, the role of news media in creating consensus, the identities by which they define themselves, and how their sense of identity and community is shaped by digital technologies. Other strategies which aim to support student learning include the highlighting of key concepts (from aesthetics to vertical integration) which are linked to a glossary (composed by research assistants Nicholas Holm, Carolyn Veldstra, and Tim Walters). "Close ups"—pithy summaries of key concepts, theories, and movements—address, among other topics, capitalism, cultural studies, ideology, hegemony, semiotics, moral panic, realism, instrumental rationality, consumption and 9/11, the consumer confidence index, corporations, disability, nations and nationalism, "Refus Global," malls and public space, and the Zapatistas and the internet. Having taught with the first edition of this book, I can attest that students at many levels—from junior undergraduates to graduate students—seemed to find it lucid and enabling, especially for the many ways in which it helped them to explore popular culture as "a shifting and contested arena of power" (51). The new edition is even better, including more material on digital culture, a new chapter on spaces and places of popular culture and expanded, updated case studies and readings. As an instructor, I welcome the book's resources, tools and, above all, its invitation to informed dialogue. O'Brien and Szeman become participants in the classroom debate which they encourage with their open-ended questions and conversational tone, sustained through the most complex material. The online supplementary material for instructors follows through on this promise of dialogue: it includes a sample 12-week course outline accompanied by reflections on its efficacy by graduate teaching assistants and a commentary by the authors which is bracingly frank about the challenges involved in teaching this subject. Using this book does mean committing to difficult questions which the authors regularly put on the table: the complicities and power relations of the classroom, the economic and social inequities of capitalism, the privileges and exclusion which popular culture can promote and resist, all of which touch all classroom participants. They insist that "we all need to attend to the injustices created by the spaces and places of the contemporary world" (318). But O'Brien and Szeman are also opponents of "political stasis" (181) or critical paralysis. Their aim is to support critical debate about the use of popular forms, and to model how action can issue from spirited reflection and communal creation. In this, their book is a tour de force—practically, pedagogically, theoretically, and politically. Christine Bold is author of Writers, Plumbers, and Anarchists: The WPA Writers’ Project in Massachusetts (2006); The WPA Guides: Mapping America (1999); and Selling the Wild West: Popular Western Fiction, 1860-1960 (1987), as well as essays on popular culture and cultural memory. She coauthored the award-winning book Remembering Women Murdered by Men: Memorials across Canada (2006) by the Cultural Memory Group, a collaboration between academics and social justice workers. She is currently editing U.S. Popular Print Culture, 1860-1920 (one volume in the Oxford History of Popular Print Culture) and writing a book titled The Frontier Club: Popular Westerns and Cultural Power, 1880-1924.